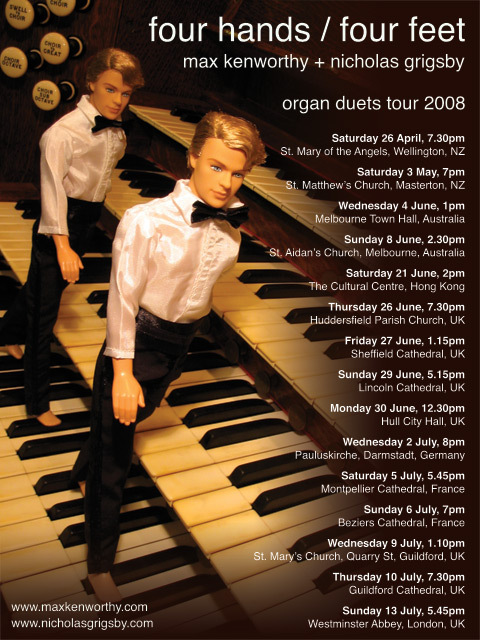 Max and Nicholas gave their first organ duet recital together at Wellington Cathedral, New Zealand, in May 2004. Initially an experiment, the success of this recital has led to numerous further performances and a greatly expanded repertoire encompassing the sphere of organ duets, including transcriptions and works specifically conceived for the idiom. They have now given recitals all over the world, including concerts at Melbourne Town Hall, The Hong Kong Cultural Centre, Lincoln Cathedral, Westminster Abbey and the Basilica of the National Shrine in Washington DC, USA. Their most recent collaboration took them to New York City and the Bermuda Festival in 2014. 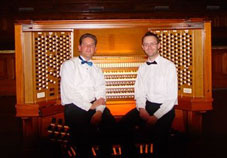 In 2007 they released a CD entitled four hands / four feet recorded live in Dunedin Town Hall, which spent six weeks in the Radio New Zealand Classical Chart Top Ten, and has also featured on the BBC’s The Organist Entertains programme and Pipedreams on public radio throughout the USA. It is available from all good classical music shops and online.